This is quickly becoming a favorite amongst Emily’s circle of friends. She served it at a dinner party, and has been handing out the recipe every since. Combine dressing ingredients. 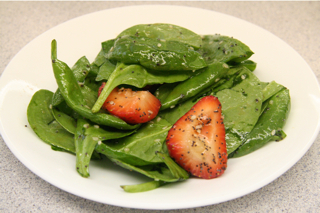 Toss spinach, strawberries and almonds with half of the dressing. Refrigerate the remaining dressing for another use.